Karen Eisenhauer and Rachel Gerstein were facing issues with the barn at their home. It was outdated and worn, not the safest environment for their two horses. They visited a farm a few miles down the road, and when they found out that equestrian facility had been built by Quarry View Construction, Karen knew exactly who to call. 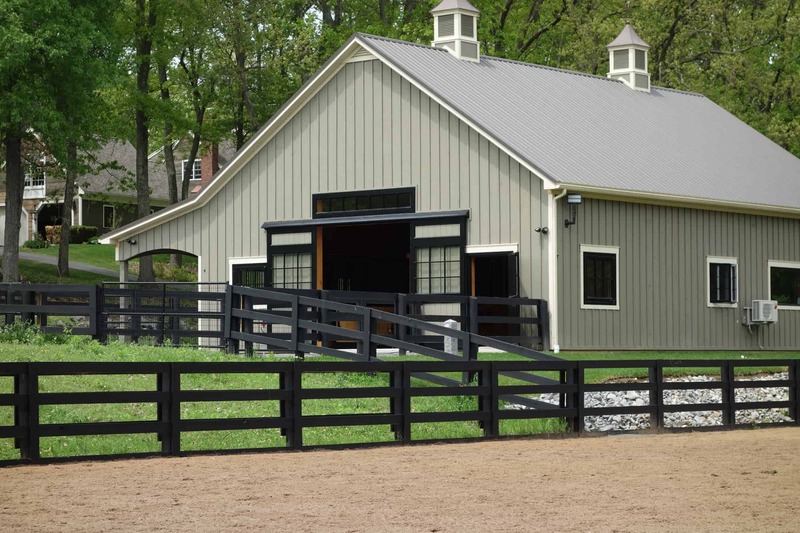 Upon assessing the situation and noticing their old barn’s bowed walls and poor framing in February 2017, we advised them against renovating and suggested building a new residential horse barn. Renovating the structure would come with the risk of needing more repairs in the future, putting their horses in a bad spot again and making it more financially draining in the long run. Designing and building a new structure would give them the flexibility to include exactly what they wanted. Karen told us she’d been thinking of offering boarding services for one or two horses in the future, so starting from scratch, we collaborated with Karen and Rachel to design a barn that would meet their current and future needs. In addition to the barn, they also wanted to add quite a few paddocks, which we fenced for them that May. After guidelines had been set and plans drawn up, The Quarry View Construction team began working on the exterior of the barn in September of that year, but we had to put the project on hold for a few months due to an unanticipated wait on plumbing and electrical support. The project is slated for completion in early February 2018. The new 1800-square-foot, four-stall barn features a wood frame, wood siding, and metal roofing. We installed aluminum framed doors with wooden inserts to ensure minimal wear over time. Laminated hardwood flooring in a large, heated tack room gives horse lovers a comfortable and stylish place to talk about their rides. The barn also contains a wash room, feed room, and storage areas for hay and feed, and pavers that provide a unique touch to the center aisle. To better protect the horses, the new residential horse barn features a 12-foot lean-to over the Dutch doors on one side of the structure that allows the horses to get fresh air while protecting them from harsh weather. Karen’s and Rachel’s horses will be at home in their stalls that feature stall mattresses, specifically designed with equine comfort in mind. Unlike the average stall mat, stall mattresses are much softer and have extra layers of cushion to provide better padding. By early February 2018, Karen and Rachel will have a comfortable home for their horses and boarders when they choose to start boarding. Our team of experienced designers and contractors can help you bring your next big venture to life. Contact us today to share your story.